Just a very quick post before we head off to Isabela this afternoon. No need for me to repeat what the others have said about yesterday, as I think it is fairly obvious it was a day we will all remember for a long time! Nick’s video is great, and shows just how close the sealions and turtles came, and how unfazed they were by us, and our strange appearance and gadgets! When we next have some internet access (which might be back in the UK according to reports about Isabela’s connectivity) I will upload photos and my videos from underwater. I think it was an amazing ‘high’ to leave Santa Cruz on, and we are looking forward to what Isabela has in store! hopefully we can continue to blog from there, but if not, there will certainly be more to follow on our return to the UK. And I think I could definately join a sealion’s harem – lazing in the sun with the occasional banter with the odd (in every sense of the word!) swimmer sounds right up my street! I think it’s fair to say that yesterday was one of the highlights of my life. At least. After travelling for two hours by speedboat, we reached San Cristobal island. After a talk on the importance of conservation in the Galapagos and an informative wander round an exhibit detailing parts of the islands history (I found out that the Galapagos islands were the place they sent convicts from America at the early turn of the century) and environmental statistics, we what can only be described as ‘trekked’ up a mount in the midday heat but it was worth it when we reached the top. 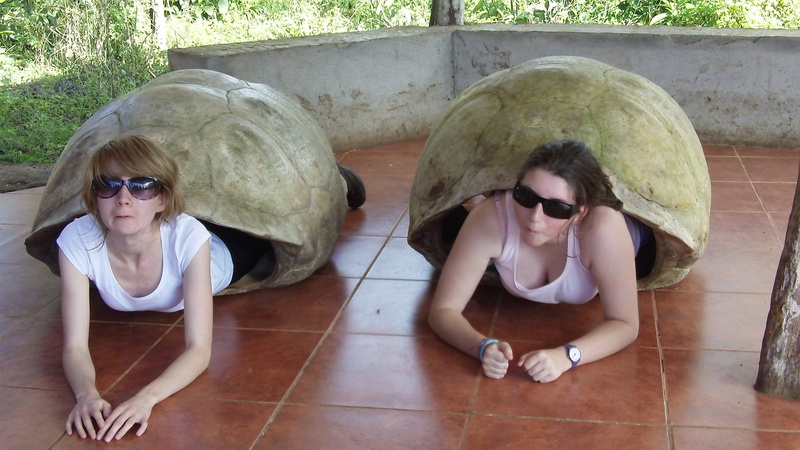 If I couldn’t sit on a real giant tortoise, I made sure I sat on a model one! On the way to lunch we walked past the harbour. It was brilliant watching the sea lions in their natural habitat, lazing on the beach in the sun. 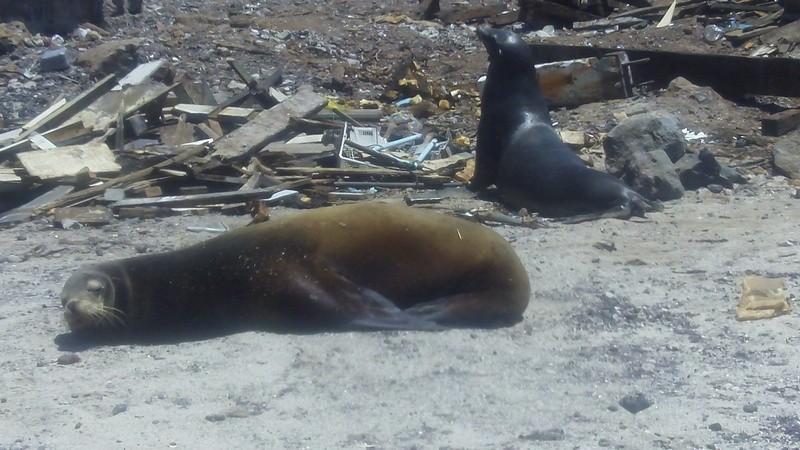 However, all of the recent talks about human impact on the Galapagos hit home when, on one side sea lions were lying on a golden beach and splashng in the birght bue ocean, but on the other side they were sunbathing next to rubble and concrete blocks used to make the next building encroaching on the habitat. After lunch we walked to a beach called ‘Sea Lion Refuge’. Now, sea lions are one of my favourite animals so I thought it was amazing to be able to see them in the water and on beaches. It was extradordinary to be able to sit less than two metres away from them and copy their lazy, sun worshipping ways! There were about forty, fifty, possibly sixty sea lions all huddled together with at least three babies. 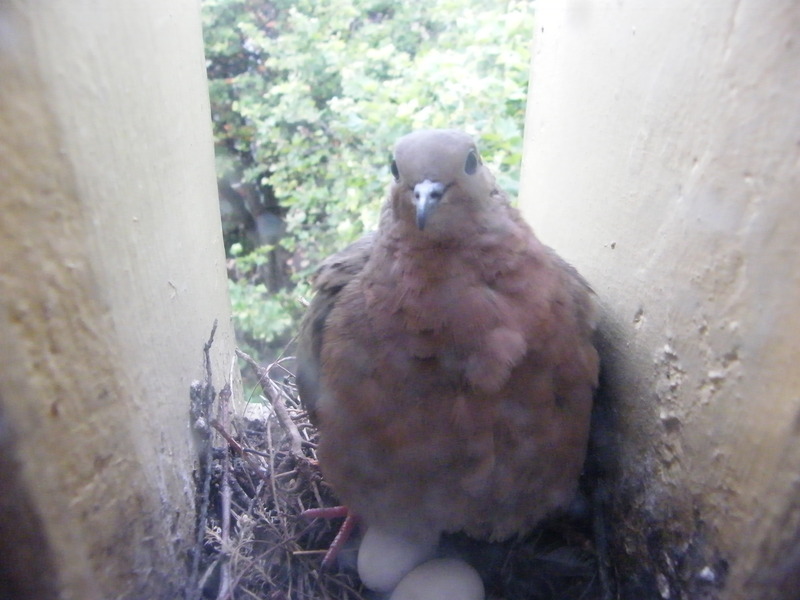 Looking to the future, I was quite pleased to see quite a few babies because it means that, hopefully, the population is far from declining. Hearing the barks of them playing in the sea, the baby suckling and the slaps of running flippers, I was actually speechless. Now, time to pack for Isabella…. We’ve had a busy couple of days! On Wednesday we visited a local school and joined in with some of their lessons. 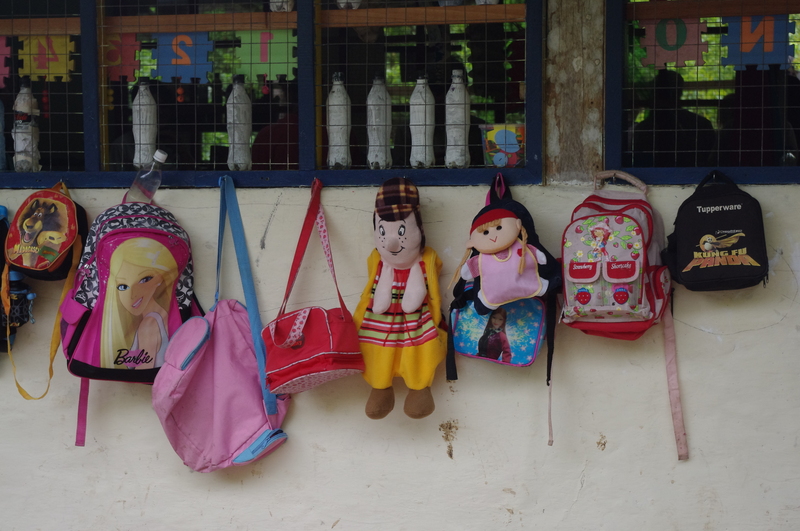 It was very interesting to see how their school life seemed a lot more relaxed than ours. We met some amazing people! 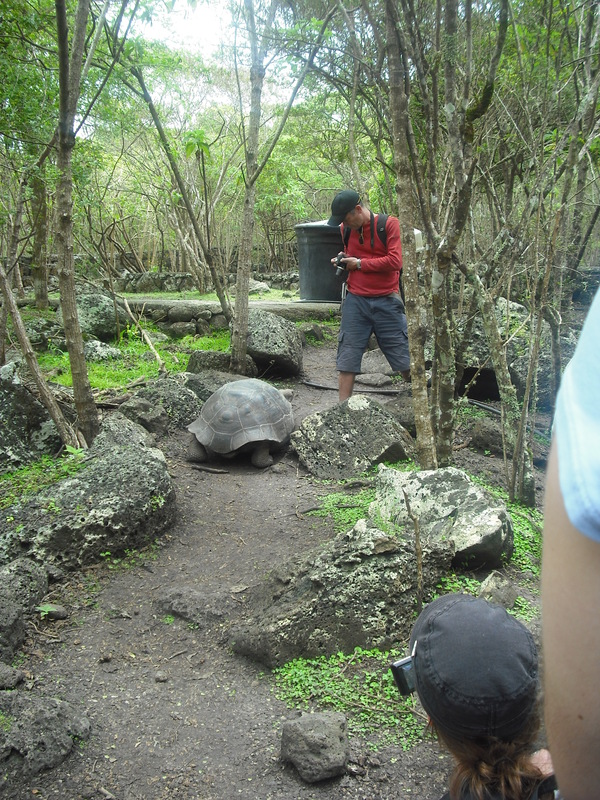 In the afternoon some of the students took us to a tortoise reserve they were involved in, where people from the Charles Darwin Research Station told us about what they’re doing to monitor the islands. On Thursday we visited the recycling centre where we leant a hand. We took tops off bottles, put paper in bags (which required getting into the wheelie bin) and worked on the conveyer belt sorting out the different recyclables. The people working there were very funny especially when some odd items came along. In the afternoon we went to Tortuga Bay which was a 2km walk but it was worth it. The waves were huge! There was over a hundred iguanas all crammed in to one place. There was also a blue footed booby about a metre away from us. On Friday we went to the Charles Darwin Research Centre and learnt some interesting things about how humans impacting the islands by introducing new species and how the population has dramatically increased over the past 20 years. 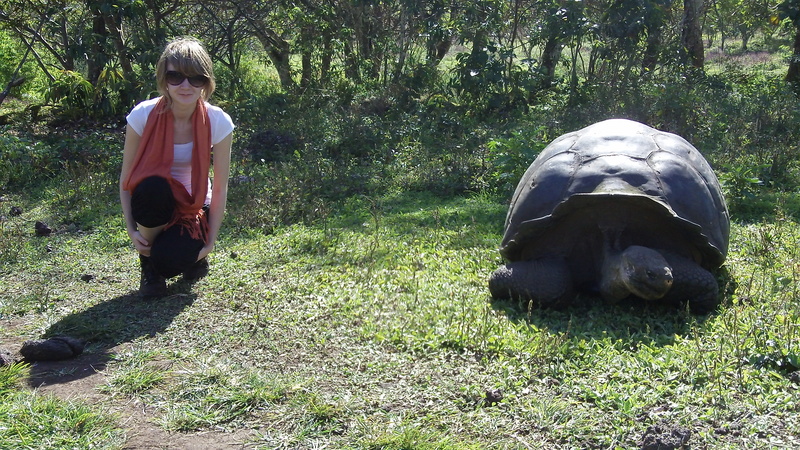 We also met Lonesome George the last surviving tortoise from the island of Pinta. He seemed happy considering. 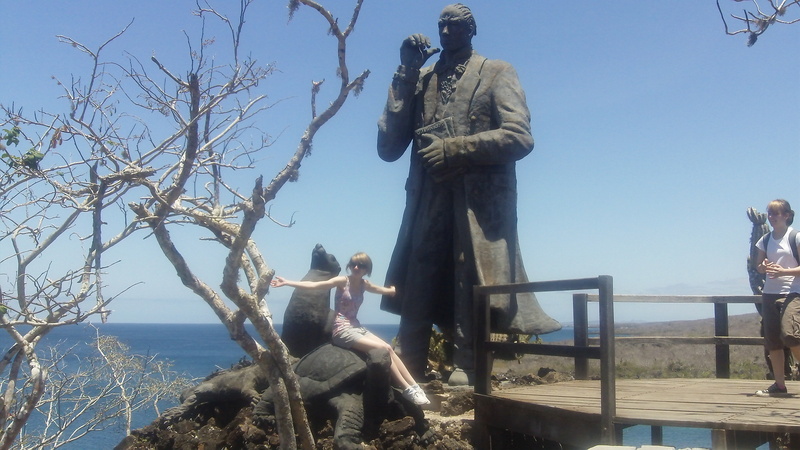 Today we went to San Cristobal and visited the interpretation centre and went along a new trail to a statue of Charles Darwin at his first landing site on the islands. We all had our photo taken with him. After lunch we snorkelling and sea lions were swimming right up to our faces and doing flips in front of us. I was a bit scared at first but got used to their playful nature. A sea turtle swam right past me and underneath me. It was an incredible afternoon. On the boat back some dolphins passed by the boat. Thanks to everybody who has helped us on Santa Cruz!!! People who have given us interesting talks, been our tour guides (Franklin and Javier), the staff at the hotel Villa laguna and the many drivers of cars and captains of boats. Wednesday – We visited Tomas de Berlanga School , a private school nestling amongst vegetation with pupils ranging from 3 to 16 years old. Not quite what we might imagine a private school to be like in Britain. This school consisted of a few simple single storey buildings with open sides, roughly painted walls, simple wooden furniture, connected by larva ash paths weaving through the dense plant growth. There was a playground with brightly painted wooden swings and slides and a dusty football area. The younger children rushed around in their t-shirts and jeans with beaming smiles. 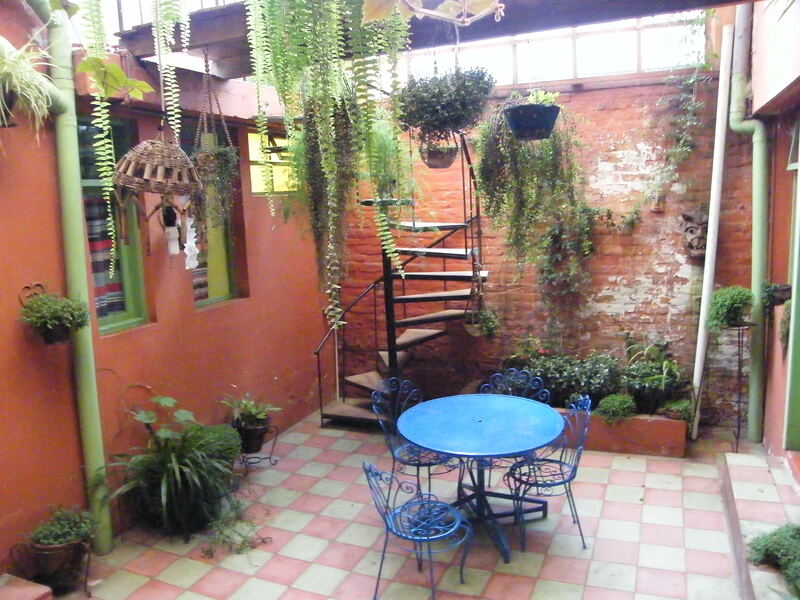 The purpose of this school is to educate the children to be effective communicators in Spanish and English, to be critical thinkers and to have a passion about their environment. Our 4 girls had the opportunity to interact with many of the teenage pupils. I was able to have a long conservation with the science teacher. She had little in the way of practical equipment and no laboratory but was so keen to encourage a problem solving approach with her pupils. A small group were preparing a project about the brain for a science fair and we attempted some of their brain teasers. I was very pleased to be able to take apart the two intertwined nails before the girls! This morning I shed a tear as I stepped off the ‘plane onto Santa Cruz. I had actually arrived on an island of the Galapagos archipelago. On cue, there were a couple of finches on a small cactus plant showing off at the entrance of the ‘disembarkation control’, a large low shed. Here we waited (I momentarily felt I was queuing for a ride in a theme park) to show our Galapagos National Park visa, pay a fee for the privilege of visiting this hallowed ground and have our bags checked for ‘illicit goods’ i.e. any foreign organic material, alive or dead, which could affect the ecological balance of the islands. (Another example of the conservation strategies in the airport cloakroom – ‘Please put toilet paper in the bin not down the toilet’.) 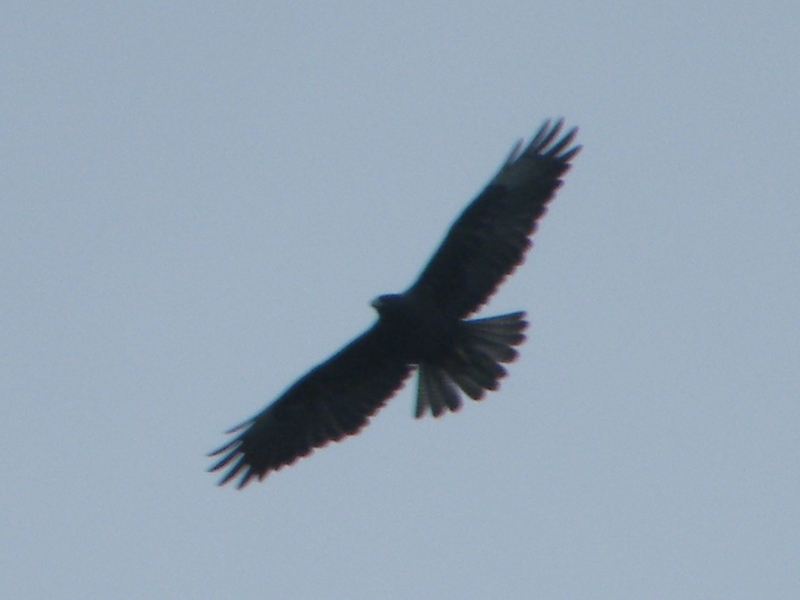 A frigate bird flew overhead as we left the airport. It wasn’t long before we were travelling in a small minibus through distinct vegetation zones on our way to the highlands of Santa Cruz. There were many apparently dead grey trees in the arid zone – Palo Santo or Incense trees – stretching their branches proud of the rather scrubby green vegetation. (These trees are .playing dead – they are leafless for much of the year.) As we rose higher the plants became more varied, a spectrum of greens interrupted by the occasional red and yellow flowers. Lichens hung in long strands from branches. In some areas we could see large numbers of cattle egret (– they arrived naturally in the Galapagos in the 1960’s and have increased rapidly). 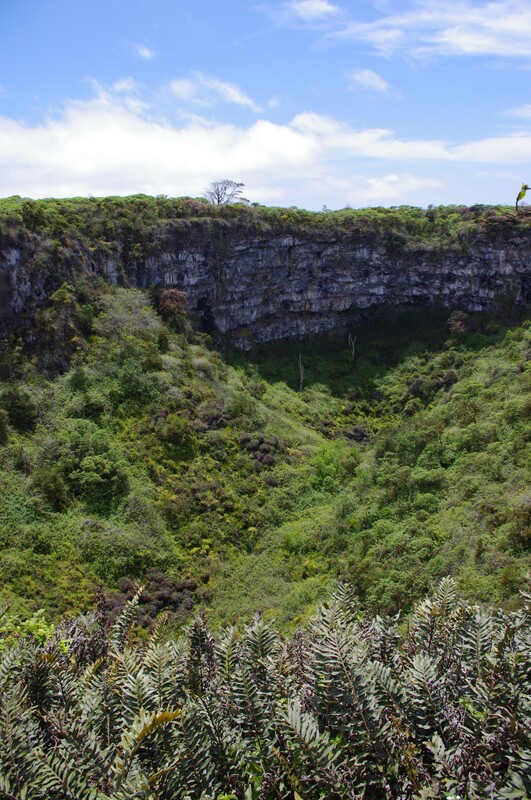 We stopped in the highlands to see Los Gemelos (the twins) – a pair of craters formed by collapsed caves. 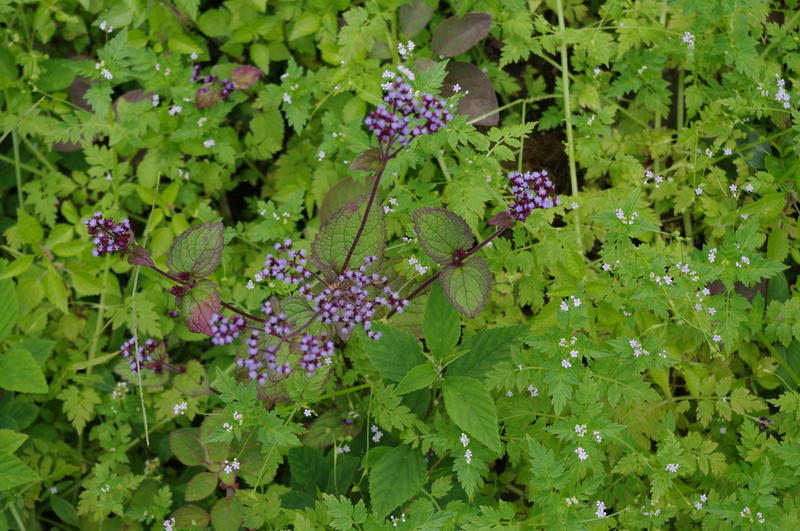 Their steep rocky grey walls were draped in greenery. The dominant plant in this zone was the Tree Scalesia with many flowering plants (mostly yellow and purple flowers), ferns and mosses forming the ground cover. Just getting ready to go out out for dinner after our third day on Santa Cruz island. It keeps on getting better and better. Monday, after landing, we visited the first tortoise reserve of the trip in the highlands. I was surprised at how quickly the plants and trees change from bare to a blanket of leaves within a few centremeters. As soon as we hopped off the van we saw our first tortoise: a beast of a fella just quietly munching on some leaves on the roadside. At this point, we didn’t realise how many more there would be. The thing that amazes/amazed me most about tortoises is the noises they make. Everytime they move they make a huffing and sighing noise, even for a few little steps. Also, the noise of their shells scraping the ground sounds like a boulder being pushed in a cave. Everything is such an effort for them. To be fair to them, I’d be out of breath if I had that much weight to carry. It’s difficult to comprehend how big they actually are until you’re standing next to one. It gave us a great chance to practice our toroise faces though! Yesterday we went to Floreana Island which involved a two hour speed boat journey there and back. I did learn that a life jacket makes a very comfortable cushion for a nautical nap. As soon as we got off the boat we saw sea lions, iguanas, lizards, blue-footed boobies, Sally lightfoot crabs, everything! (Cue much excitement and many squeals from the group). It was everything I’d read about. Before we could run out our camera batteries, we were taken on a tour o the highlands. To get there, we had a roughly twenty minute journey in a van that can only be described as “bone shaking”. It was especially fun when we sat at the back on the way back down! 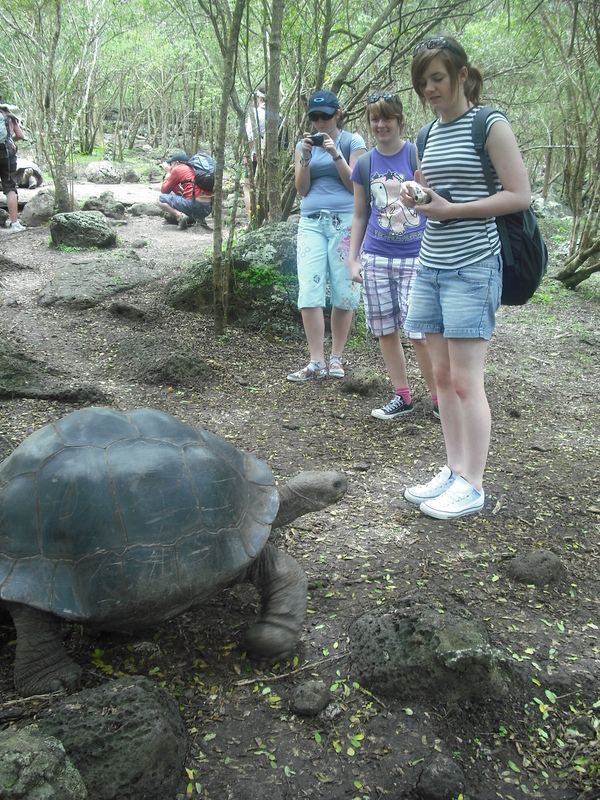 The views were spectacular and we had an opportunity to walk amongst more tortoises at the tortoise reserve. We were lucky enough to see two males fighting, mainly using their necks as weapons. A couple of the tortoises were very curious in us, Charlotte and Mr.Alford in particular, often following us as we walked around. After a delicious lunch of fish, rice and veg (with coffee cake and cream for dessert-my favourite!) we wandered round the pier and were able to take lots and lots of photos of wildlife that was SO close to us! 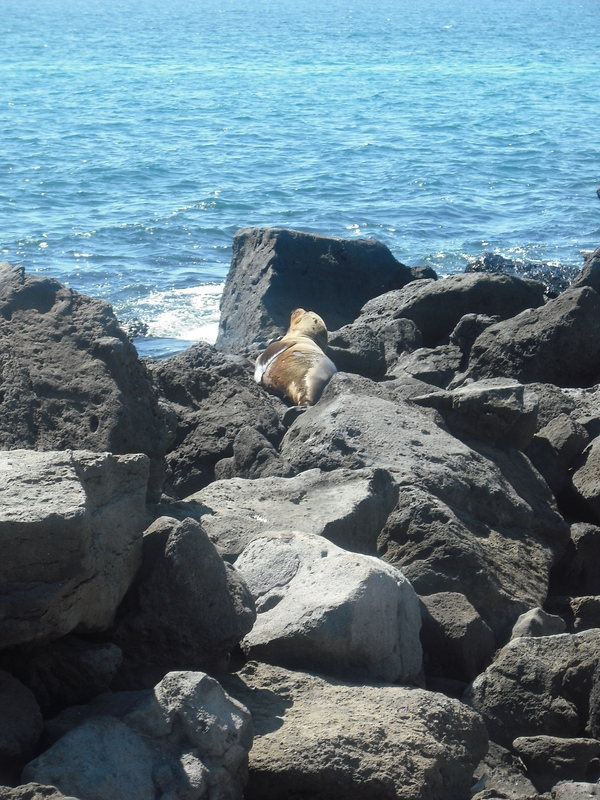 Sea lions lazing on the rocks, iguanas giving us sceptical looks as we got nearer, crabs scuttling away as soon as they saw us. None of the animals were particularly bothered by us being there, as long as they got to lay in the shade. Today we went to the Tomas de Berlanga school. It was so fasicnating to speak to the local children and compare how they learn and what they study. The only study a few core subjects such as physics, biology, english, music, maths and art. The pupils were horrified when I explained our exam system to them. Their english was very good and the little kids were so cute and funny, running in between us, giving high-fives and giving us gifts of a leaf and raw pasta (pasta paintings are clearly on the curriculum all across the world). It showed me how formal our education system actually is. The relationships between teachers and pupils is very relaxed and personal, calling each other by first names, often hugging each other and generally being tactile with one another. We wouldn’t dream of being like that with our teachers! It probably helps that the average class size is about ten pupils. I know that most of the students I spoke to had Facebook so, if you’re reading this pupils of Tomas de Berlanga school, maybe we could stay in contact? 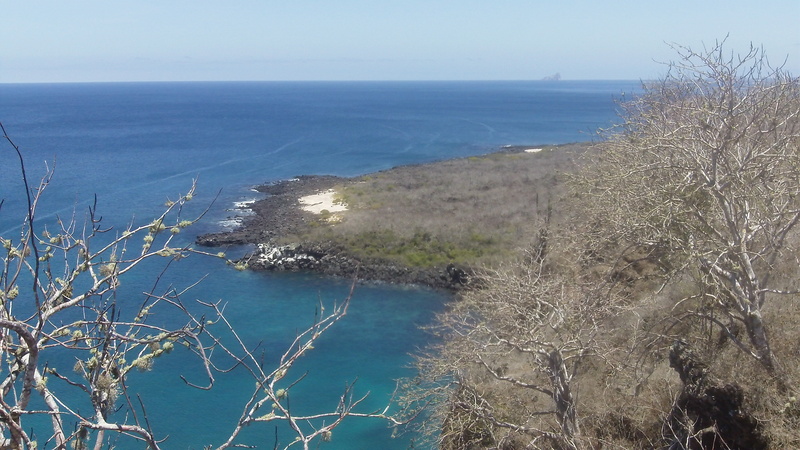 As I noted in my inaugural post here, our little band of Darwin wannabes isn’t just visiting Galapagos… we’re going to try capture our experience the way Darwin did – through notes, ‘specimens’ and prose. Unlike Darwin (and of course this isn’t the only way we’re unlike him), we’re doing this in public and online for all to follow along live. My proposal — ‘Galapagos 2.0’ — is why I was selected to accompany the four lucky deserving 17-year-old Survival Rivals winners (Becky Hill, Eleri Morgan, Charlotte Woodfield and Jess Woodfield), their teachers (Sue Benjamin and Nicholas Alford) and representatives from the Wellcome Trust (Amy Sanders) and Ignite! (Amy Turner). I guess I’m a kind of guide, if not to Galapagos (as I’ve never been before) then to Darwin, evolution, and the voyage of HMS Beagle. 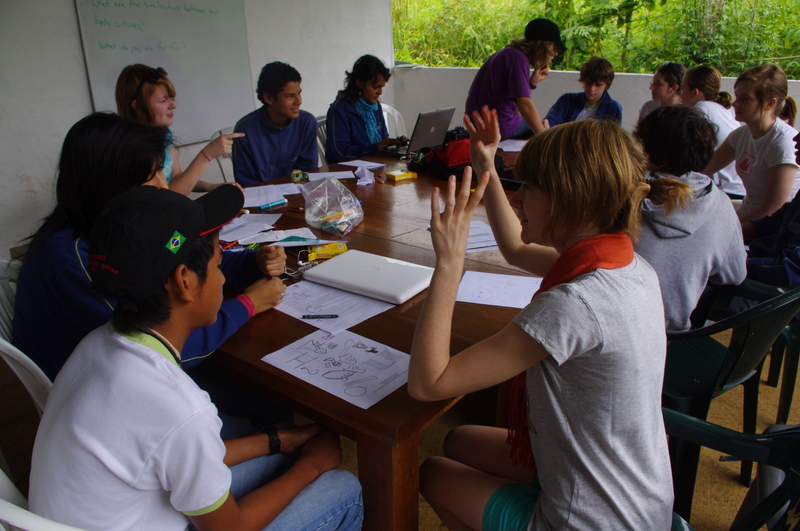 The proposal’s full title is ‘Galápagos 2.0 Creative science learning and communication in evolution’s spectacular living laboratory’ and the gist is that our little band of Darwin wannabes will be doing what Darwin did in Galapagos. That is, we will capture our experiences, ‘specimens’, thoughts, connections and speculations – not using a pen and a red notebook, but Twitter, Flickr and YouTube. At the end of each day or few days, we will raid our tweets, photos, videos and memory banks and write a short, illustrated blog post (using WordPress). And at the end of the trip, all of this will serve as our source material for our own version(s) of Darwin’s Journal of Researches (better known now as Voyage of the Beagle), an e-Book to be written and published approximately six months after the trip. Darwin used layers of increasingly formal writing tools — field notebooks & specimens ➙ diary ➙ book — and so will we, except that our technology will be a little different: Twitter, Flickr and YouTube ➙ Blog ➙ e-Book. 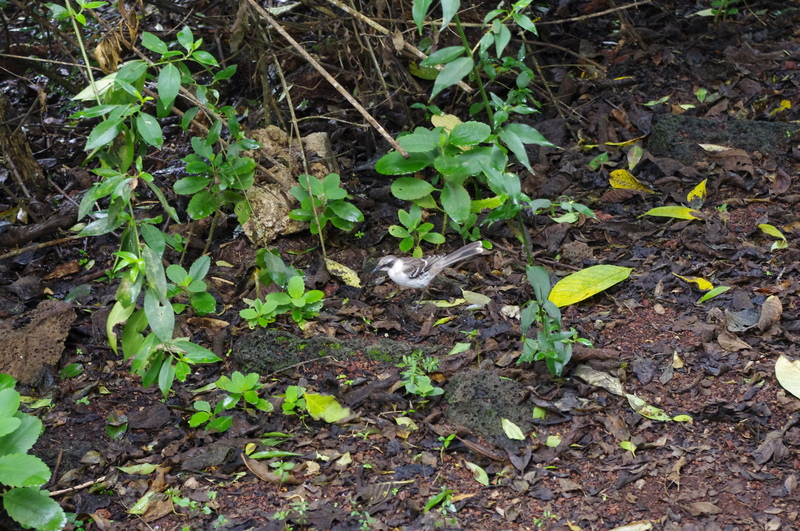 So follow us here on Galapagos Live but also on Twitter, Flickr and YouTube for the full immersion experience! For the full proposal (which begins with the sentence, ‘Charles Darwin would have been a blogger.’) in its original PDF format glory, click here.